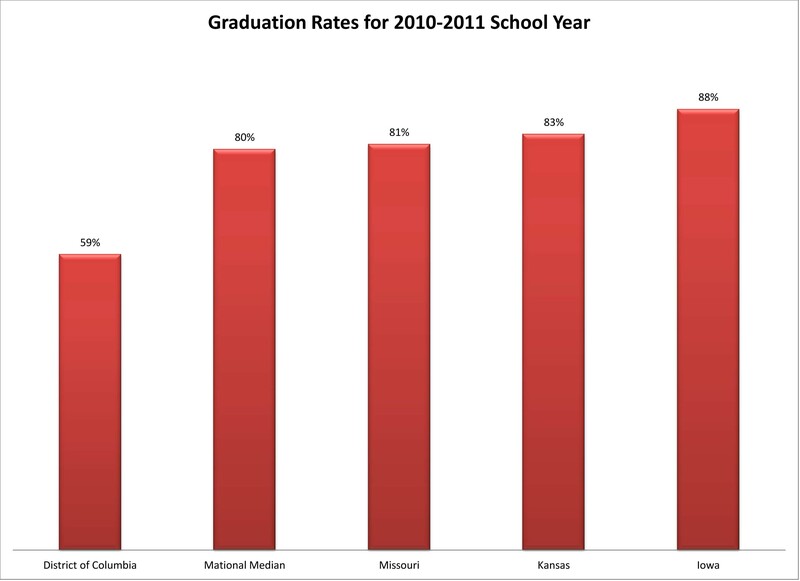 At first glance, the graduation rates for Missouri and Kansas — while showing room for improvement — don’t look too bad. Not in the top 10 but not at the bottom of the rankings, either. 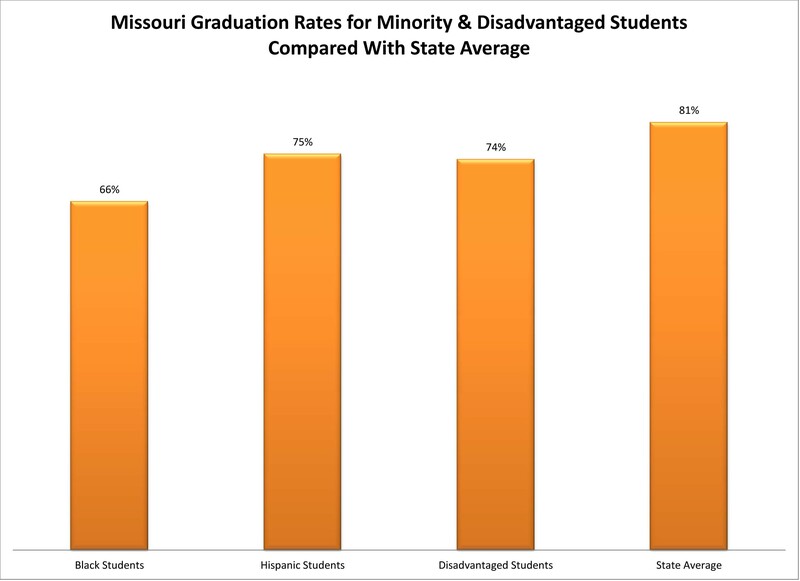 But take a look at the graduation rates for black, Hispanic and disadvantaged students, because that’s where the problems lie. Yesterday the U.S. Department of Education released preliminary data for the 2010-2011 school year. A new federal requirement for all reporting agencies to use the same calculation method now makes it possible to compare graduation rates among states. And the data show that Kansas and Missouri are not alone in reporting achievement gaps among students. Although data is not yet available for all, there are numbers for most states. Those numbers show that students really intent on graduating should attend school in Iowa, which has the highest graduation rate at 88 percent. Students have the lowest chance to graduate in the District of Columbia, which has the lowest graduation rate at 59 percent. In our two-state region, both Kansas and Missouri report graduation rates above the median, which places them solidly in the middle of the pack with room to grow. Are there other states where black students would be better off, as far as graduation rates are concerned? Or Hispanic students? Or disadvantaged students? 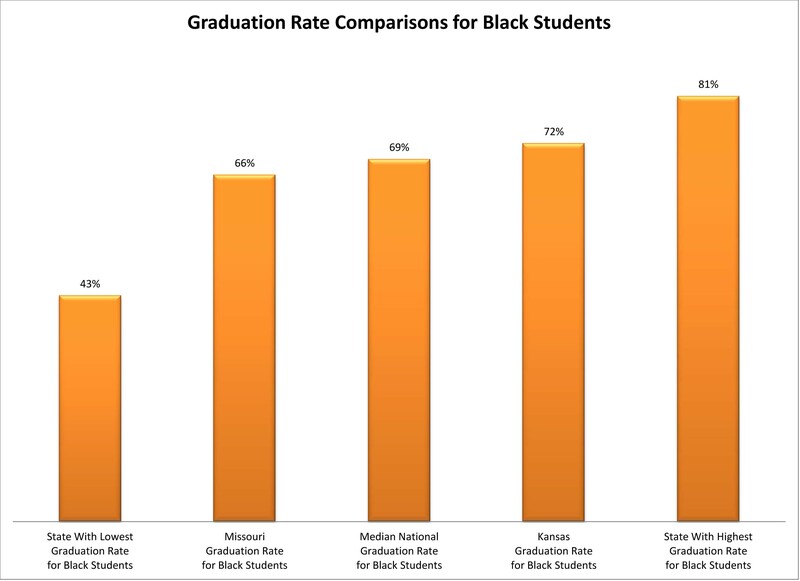 For black students, Nevada has the lowest graduation rate. Montana and Texas tie for the highest rate. New Jersey has the median. Missouri scores below the median, while Kansas scores slightly higher. 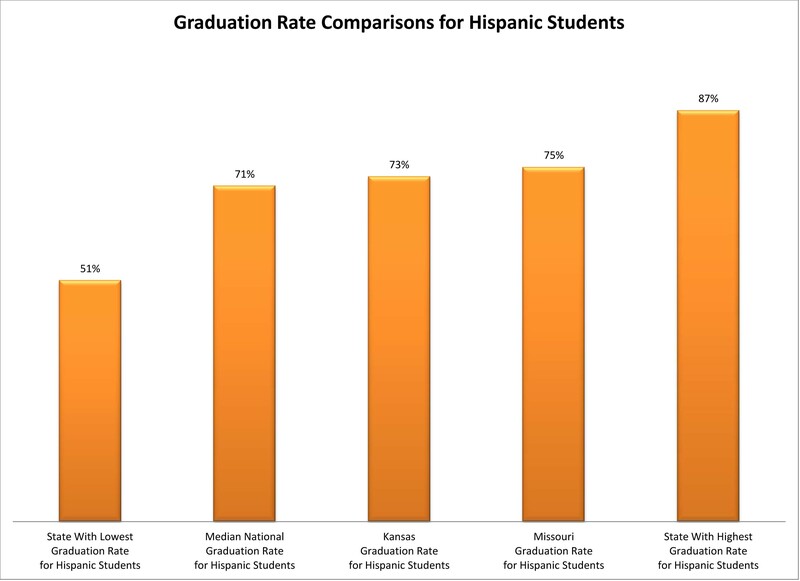 For Hispanic students, Minnesota has the lowest graduation rate. Maine has the highest rate. Delaware, Virginia and West Virginia tie for the median. Missouri and Kansas score above the median but nowhere near the top. 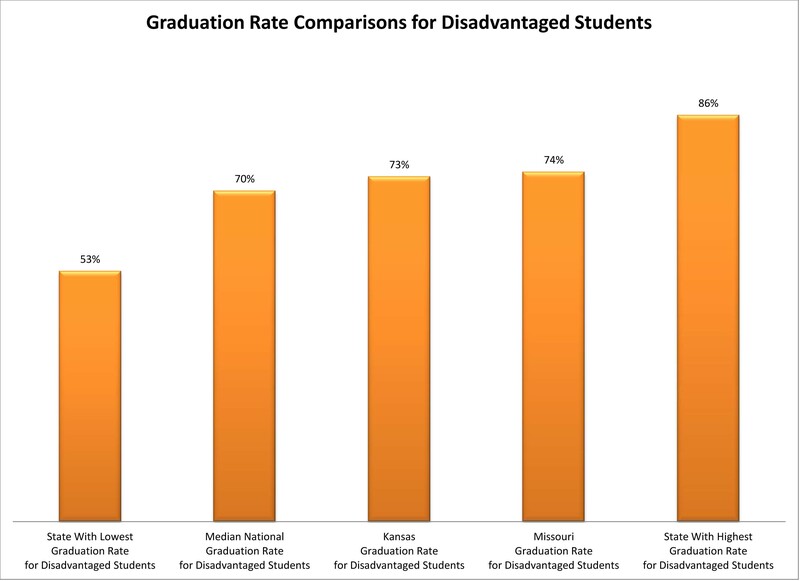 For disadvantaged students, Nevada has the lowest graduation rate. South Dakota has the highest rate. California, Massachusetts and Virginia tie for the median. Kansas and Missouri score slightly over the median. The U.S. Department of Education released data today detailing state four-year high school graduation rates in 2010-11 – the first year for which all states used a common, rigorous measure. The varying methods formerly used by states to report graduation rates made comparisons between states unreliable, while the new, common metric can be used by states, districts and schools to promote greater accountability and to develop strategies that will reduce dropout rates and increase graduation rates in schools nationwide. The new, uniform rate calculation is not comparable in absolute terms to previously reported rates. Therefore, while 26 states reported lower graduation rates and 24 states reported unchanged or increased rates under the new metric, these changes should not be viewed as measures of progress but rather as a more accurate snapshot. 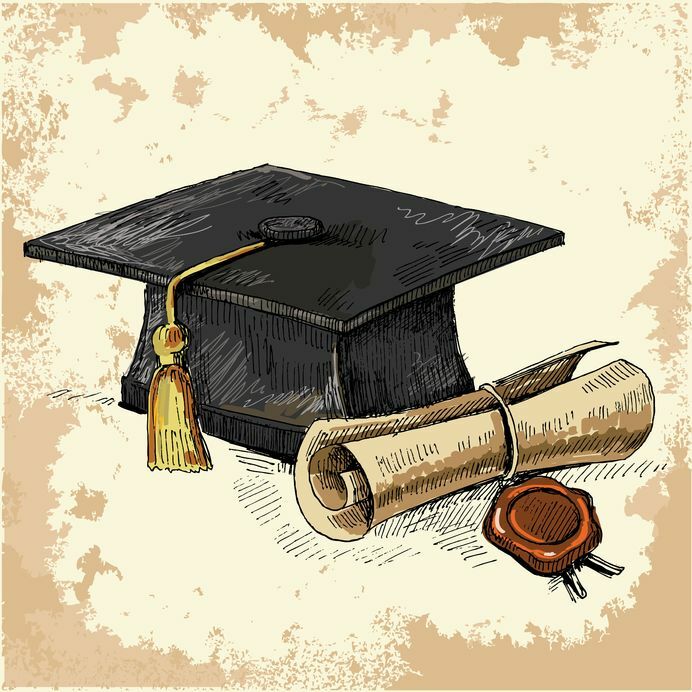 The transition to a common, adjusted four-year cohort graduation rate reflects states’ efforts to create greater uniformity and transparency in reporting high school graduation data, and it meets the requirements of October 2008 federal regulations. A key goal of these regulations was to develop a graduation rate that provides parents, educators and community members with better information on their school’s progress while allowing for meaningful comparisons of graduation rates across states and school districts. The new graduation rate measurement also accurately accounts for students who drop out or who do not earn a regular high school diploma. In 2011, states began individually reporting 2010-11 high school graduation rates, but this is the first time the Department has compiled these rates in one public document. These 2010-11 graduation rates are preliminary, state-reported data, and the Department plans to release final rates in the coming months. Beginning with data for the 2011-12 school year, graduation rates calculated using this new method will become a key element of state accountability systems, including for states that have been approved for ESEA flexibility. To view the data released today, see the attached document. The rates will also be posted in the coming days on ED Data Express: http://www.eddataexpress.ed.gov/. Thanks for validating that my job needs to continue! Some of the minority kiddos fit into more than one category as well. Check out a web site accessible from the KSDE web site entitled, “Kansas Drop-Ins”. Interesting will be the cohort graduation rate. It is not enough that the students graduate but that they must do it in four years. Not perhaps a huge issue for many but when we start with kids who are years behind…well they don’t always catch up in time, that before the whole family life comes into play. PS. 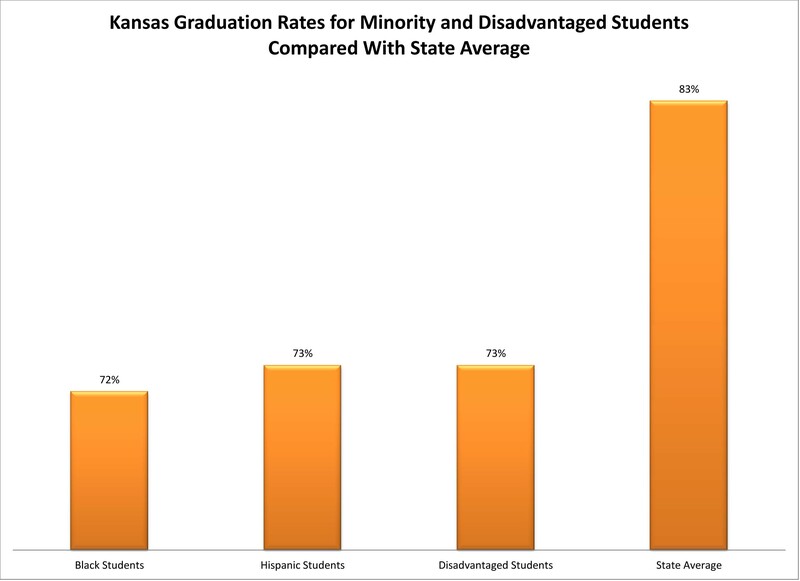 The KS minority student vs average graph is a bit out of scale there (a picky thing I know). Yes, the lack of scale troubled me, too. But I’m not proficient enough with these charts to know how to finesse it. Suggestions? About the graduation cohort, I think the more troubling issue was the large numbers of minority and disadvantaged kids who are not graduating at all and who were disappearing from the state reports, because people more skilled than me were finessing the statistics. Good point about kids from multicultural and multiethnic backgrounds. These categories are self-reported, and there is a category in the federal report for kids who identify with more than one race or ethnic group. They don’t seem to fare too poorly compared with other subgroups.